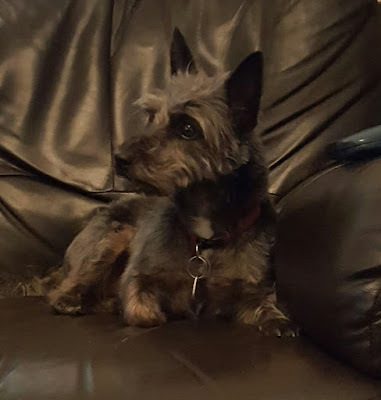 A blog dedicated to a small terrier with a massive dogsonality. We first met in the backrooms of a shelter on a cold dark October night. We went home having committed to riding the crazy train to Terrierville. 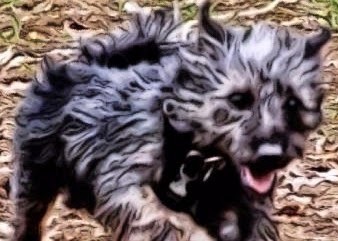 Reality bit hard when we realised that instead of the faithful calm friend of our imagination, we had a lead pulling, puddle making, pyjama hanging, dog reactive, mouthing, zooming, honking, snorting, digging, escaping, Spit the dog and Gnashers cross! Let the journey begin. Today we added peppers and spinach. It is made like a stir fry. Cut some chicken into strips and cook for about 5 minutes, add the vegetables of choice. I usually remove Muffins chicken and cook it with the vegetables which she is able to eat in a small pan next to ours. When the vegetables are cooked to your liking, add the pesto sauce and stir through. You can buy the sauce or make your own. It is simple to make. Again we leave out the onion and I use coconut milk instead of creamed coconut. I also used unsmoked haddock instead of the smoked. 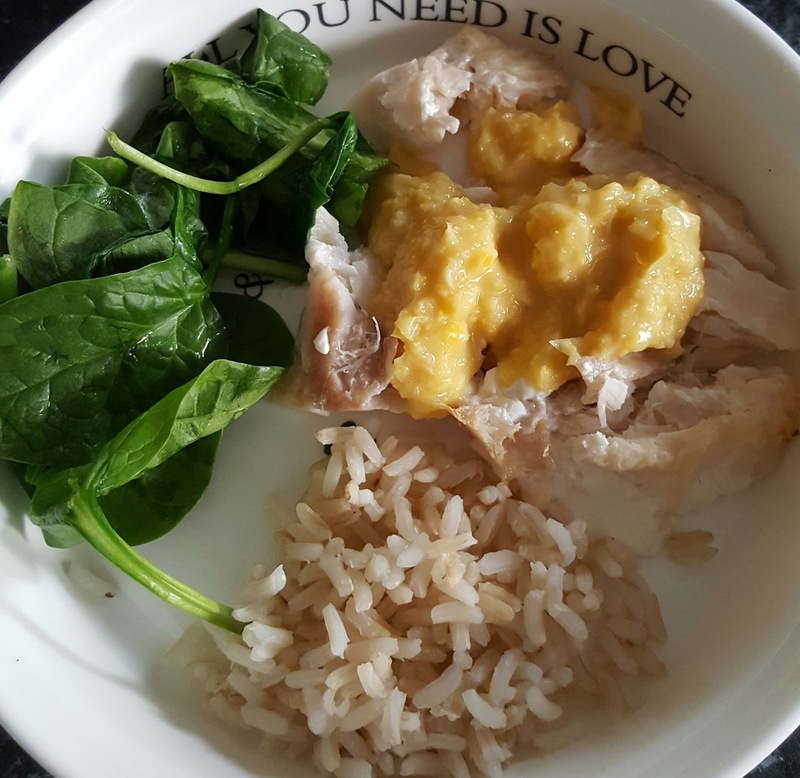 Muffin's version of this is basically, a piece of haddock, topped with blended sweetcorn and coconut milk (just a little as sweetcorn is high in sugar) and served with brown rice and wilted spinach. This dish is a firm favourite with the whole family. On paper, I didn't think it sounded terribly exciting but on the plate, it was a delicious surprise. I found the recipe on Allrecipes and we have been enjoying it as a family meal for a while. 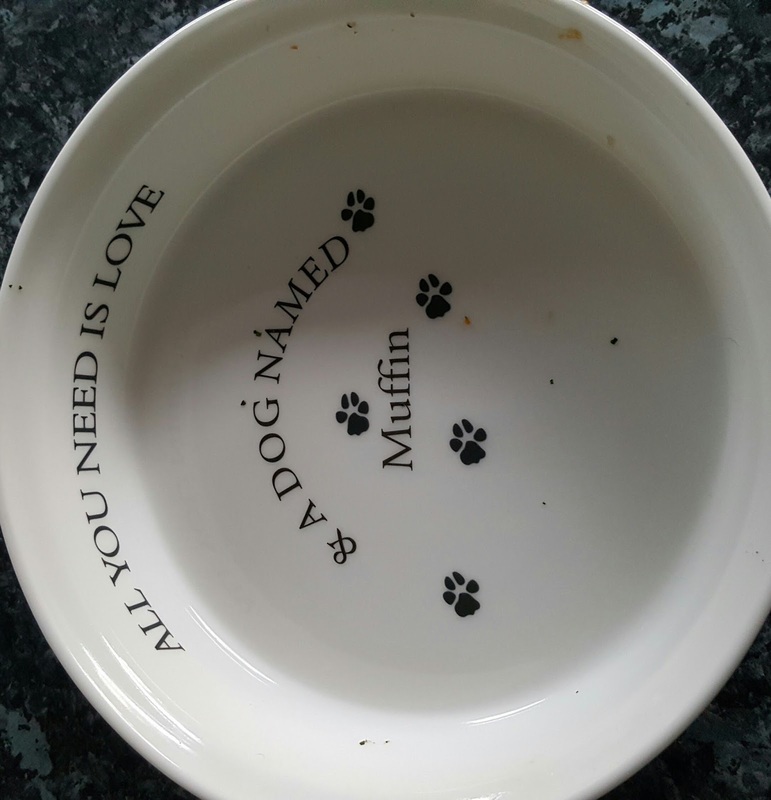 Since Muffin has been on home cooked, I saw that, with a few, modifications, it would be perfect for her too. I don't add onion, salt or pepper to Muffin's. I cook it in a very low salt, gluten free, kallo stock cube. It is quick to make and can all be done in one pan, with a little pan on the side for the doggy version. Don't forget to add your calcium source. 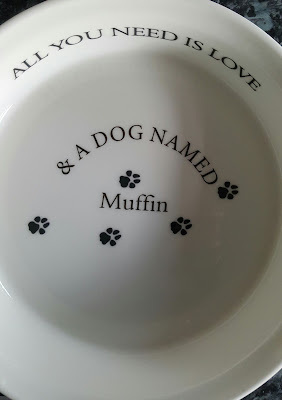 From my first days of being responsible for Muffin, this very precious addition to our family , I have been concerned with making sure I get her diet right. She looks to her humans to provide all of her food (not counting elicit foodie finds and ill gotten treats straight from the claws of an unsuspecting bird) no pressure then! In some ways that is the very reason, I have avoided going down the home cooked route. Instead, I have opted to research as best as I can and then trust the manufacturers, who tell me their food is balanced and complete. This has worked well so far. She started off on cold pressed food as I was concerned about baking and acrylamide. 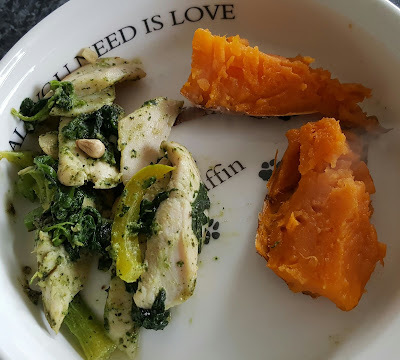 I then progressed to feeding, a mostly raw complete diet with the occasional meal of cold pressed food, when I felt I would like to add more variety. I have been reluctant to change things since, for fear of getting it wrong. After a recent vet visit however, it was a bit of a wake up call to be told that, although Muffin was still a healthy weight, we should not let her gain any more. Not being sure what to do, I continued with her old diet but cut the portions down. I was shocked when I weighed her just a couple of weeks later and the scales showed a slight gain. Clearly something needed to change. Muffin is now 7, according to initial estimations, she is slowing down and not always up for a long walk. This left me wondering what next. As I mentioned in the 'Sweet mornings' post, I had recently overhauled my own diet. I am not following any particular doctrine but I am avoiding highly processed food and trying to keep my carbohydrates unrefined. My carbohydrate sources are mostly, brown rice, quinoa, potato and sweet potato. I keep my protein sources fairly simple. We have lots of chicken and fish, some beef and occasionally lentils. I have googled 'Can dogs eat...........' a lot lately and it seems that, for the most part, in terms of what we are now eating, they can! Excellent news. All I have to get right now, is the balance and the nutrient levels. Still no pressure then! Fortunately the internet is a wonderful source of information. I am also lucky enough to be part of the fabulous All about dog food forum. This is a site which mostly looks at commercial dog foods and gives them a rating based on the ingredients. The forum is open for any thoughts, opinions and experiences with a view to expanding the public's knowledge of canine nutrition. To start our journey, I have decided to carry on feeding half a portion of the raw complete food, mixed with oatmeal made with water, for breakfast and a home cooked meal for tea. One of the biggest concerns about feeding home cooked food, seems to be about getting the calcium levels right. It is not good to have levels either too high or low, especially for puppies. It appears that calcium is a must to be added to any food which does not contain raw meaty bones. For a detailed explanation see dogaware/calcium. At the moment, raw complete, is making up about one quarter of Muffin's diet. For the rest, it is necessary to add a calcium source. I have opted for the ground egg shell idea. The dogs aware website recommends 1,000mgs per pound of fresh food. That works out at about half a teaspoon of ground eggshell. 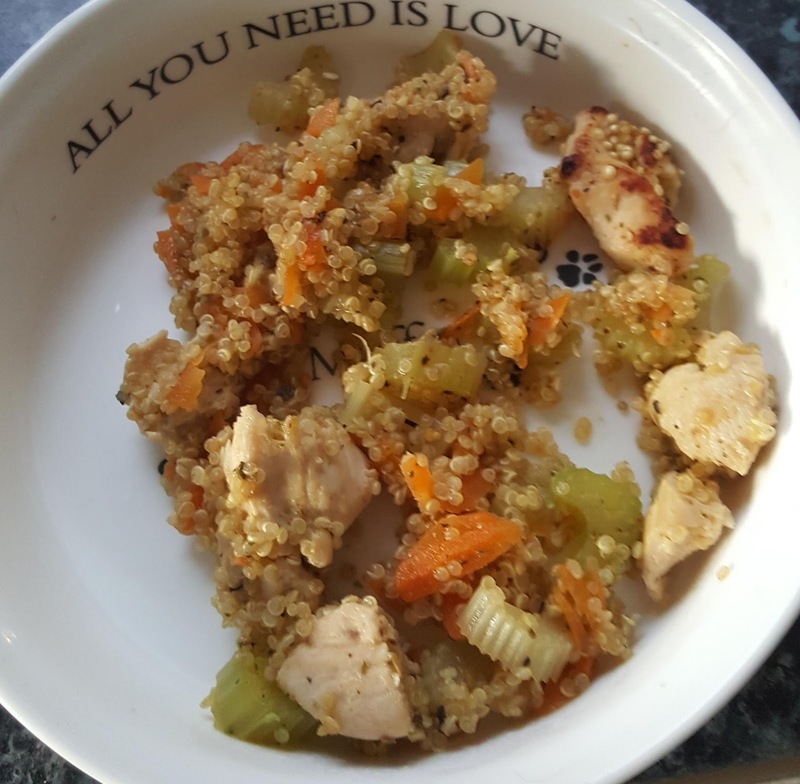 Muffin's meals usually weigh between 80gs to 100gs depending on how many vegetables she has so that works out at about a 5th of half a spoonful sprinkled on each meal. Half that amount goes on her breakfast due to the raw complete already having adequate levels. It sounds complicated but it becomes clearer as you read up on it. It can get a bit overwhelming thinking about nutrients and ratios but I try to take the same approach as I do to myself. Keep the meals as varied and fresh as possible and hopefully all major nutrients will be covered. I try to make the meals about a third each of meat, vegetables and grain or potato. In this section I will be sharing meals and treats we have tried and Muffin will be providing the feedback on taste. Lately, I have been thinking more about the way I am eating and the effects it is having on my body. I suffer from Migraine, IBS and various other auto immune type symptoms. I am trying hard to eat foods which have not been heavily processed. I am not ready to go raw and to be honest, I probably never will be. I am also no great cook but a little bit of research convinced me, that it would be fairly straightforward to keep to a menu which is based on good wholesome food. Since my diet has improved, I got to thinking that Muffin would be able to eat quite a lot of the food I am now cooking and wondering if she may do well on a mostly, home cooked diet. We have been trialling this for about 3 weeks now and it seems to be going really well. The food is very popular and I have noticed that the excitement level at tea time has gone up a notch. She doesn't seem to be hungry and best of all, she has lost a quarter of a pound! 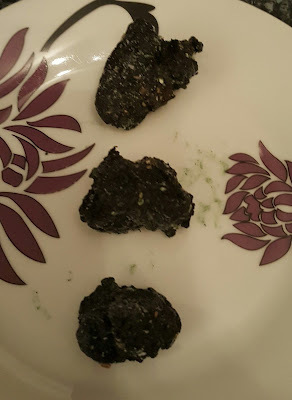 A firm favourite seems to be our occasional post breakfast treat which I have imaginatively called ' Algae bites' I was pondering how to use my recently purchased spirulina powder and not really being into smoothies, I threw a few bits in the blender and hoped for the best. *Almond milk Just a dash and carrageenan free. After blending these all together, the mixture was quite sticky. I dolloped it onto a tray and put in the freezer for a while. When they were firmer, I put them into a freezer bag and left them in there. I take one out when I am ready to eat it. They remain chewy even when consumed straight away. Muffin has a tiny piece of mine. I find them very tasty and quite sweet due to the dates. For anybody starting out on the road to healthy eating and missing sweets, these would be a good substitute. Only to be eaten in moderation of course. Sadly we don't have many left to showcase and the presentation isn't great. Both of us agree on the great taste, however and we don't feel terribly guilty when we indulge in one of these little power packed bites. Spirulina, flax seeds, Goji berries and blue berries contain a range of nutrients and can be added to any doggy dinner. or breakfast. Best to keep the sweet ones as occasional treats. If I stay very still! Spring is in the air and mischief is certainly on the mind of any self respecting terrier! Muffin is no exception. She has been outside in her yard soaking up the rare rays of sunshine and barking at any bird passing over which looks like it may have some food goodies in it's claws. She has found that this tactic, often results in the food being dropped in alarm. She enjoyed a walk across the fields but got into a bit of a disagreement with the human male over a lambs tail. Muffin found it, fair and square and was not really keen on giving it up. Happily, it wasn't attached to the lamb still but it looked a bit unsavoury. Needless to say, that particular tug of war was over quickly with the human male claiming victory. For now though, she is contemplating what tricks she can get up to after her tea. The seat she has chosen to ponder this, belongs to the human male. He got up about 30 seconds ago. Nothing like a nice warm seat to inspire terrier shenanigans. If she doesn't move, maybe nobody will spot her there. It is also a good place to take in cooking smells and try to guess what we are having for dinner. Muffin is now enjoying a mostly home cooked diet. We will shortly be adding some of her favourite recipes to the blog! Somedoggy is getting into the Christmas spirit!